France is bracing for a fourth consecutive weekend of violence with competing marches Saturday by so-called "yellow vest" protesters and those demanding climate action. While authorities reinforced security and closed iconic sites, it is unclear if it will be enough to stop the wave of violence that amounts to President Emmanuel Macron's biggest crisis to date. French riot police take position during a protest in Paris, France, Dec. 7, 2018, in this image from video obtained from social media. Even for a country accustomed to protest, recent violence reached levels not seen in decades. The tally so far: four dead, hundreds injured, stores vandalized, iconic monuments defaced. Some compare today's uprising by so-called "yellow vests" — named after the fluorescent jackets the French carry in their cars — to the 1968 demonstrations that rocked France. 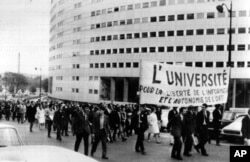 FILE - Paris students march on June 9, 1968, around the French Maison de la Radio in support of the striking TV and radio employees. The banner reads The University for the Liberty of News and the Autonomy of the ORTF (the Government controlled TV and radio system). Daily marches have been organized around the Radio House during the strike. Anger over a fuel tax hike has exploded to encompass a wider set of grievances by ordinary French struggling with low salaries and high expenses. 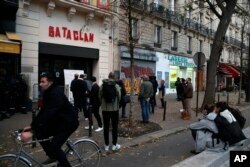 Paris seemed back to normal this week after last Saturday's rioting, with the graffiti scrubbed off major monuments. The sun was out on the city's famous Champs Elysees. So were the tourists. One of them, Malaysian tourist Lawrence Hii, said Paris "is quite a lovely city, so just a protest to show their rights — it won't hurt the tourists." But a few blocks away a different story unfolded. The regional chamber of commerce estimates the violence has cost local businesses tens of millions of dollars — not counting lost business from closing during the protests. "In the past we've had a million people in the streets without damage," said Didier Kling, president of the Paris Regional Chamber of Commerce and Industry. "What's new is there are fewer people on the streets, but they're more determined. They're a lot more mobile and a lot more violent." Business is down for shops and restaurants. Tourists are canceling hotel reservations — right at the start of the holiday season. The last time that happened was after the 2015 terror attacks. FILE - People stand in front of the entrance of the Bataclan concert hall after a ceremony marking the third anniversary of the Paris attacks of Nov. 2015 in which 130 people were killed, in Paris, Nov. 13, 2018. After pushing through unpopular reforms to make France more competitive, the government reversed itself this week, scrapping a gas tax hike it claimed would help fight climate change. But that's not enough for the "yellow vests." Many claim they're for the environment, but against more taxes. The protests are now spreading to include other groups. Xavier, a yellow vest protester, said the government "has given us some answers, but they're not enough. The divide between people and politicians is too big — they have no idea how we live every day." 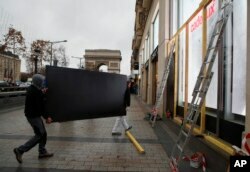 Workers carry a wooden piece to protect shop windows on the Champs-Elysees avenue, Dec. 7, 2018 in Paris. Polls indicate most French support the "yellow vests," but they're worried about the growing violence. Macron's popularity has sunk to record lows. Critics call the president — who is rich — out of touch. Business executive Alain Alain said the problem is "we're governed by technocrats. These are people with company cars, who don't pay their restaurant bills — who don't even know what the minimum wage is." What appears certain is that there is another turbulent weekend ahead — with no end in sight.